To pick up a reserved movie, push Pick Up. The screen will ask for a reservation number (issued on our website when the reservation is made), or swipe the credit card that was used for the reservation. Either action will retrieve the reserved movie. Q: When are the movies due back? A: By 9pm the following day. A: You have up to 15 days to return your movie. If you do not return the movie, the credit card that you rented the movie with will be automatically charged $25. Q. Can I reserve a movie online? A. Yes, you will need to secure the reservation with your credit card. 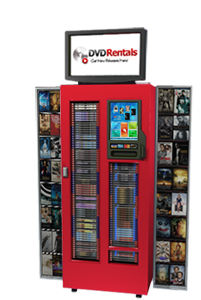 It will hold the movie for 12 hours and if the movie has not been picked up from the kiosk you will be charged for a one day rental fee. A: If you lose a movie, please contact 877-919-9488 Customer Service. For a lost movie, the credit card that you rented the movie with will be automatically charged $25 on the 15th day the movie is checked out. A: Please call 877-919-9488 Customer Service. If you call after regular business hours, please leave your name and number and a customer service representative will call you back the next day. Tip: DVDs can stop working if there is dirt or grease on the playing service. Most often, you can wipe the dirt or grease from the DVD and it will work again. You can clean the disc with a soft cloth and a household cleaner such as "Windex". Clean in a circular motion from the inside working to the outside of the disc. A: The kiosk does not issue receipts, when you rent your movie a keyboard will appear on the screen and ask if you would like to have a receipt emailed to you. Type in your email address and the receipt will be waiting for you when you return. Q: How do Credit and Debit cards work with the kiosk. A: As with any rental business, the rental company must protect their products from not being returned. With a credit card a preauthorized $5 amount is "held" against your credit line according to how many discs you are renting. This is seamless for the most part and will be reconciled when the movie is returned. At that time the amount of days out x $ per day is calculated and charged to the card. The "held" amount is released to the overall credit limit available to the card instantly by us. When a Debit card is used, this presents a different set of circumstances. The debit cards do not have a credit limit. The credit limit in essence is the amount of available funds in the account at that time. The Debit Card is preauthorized to see if x amount of $'s are available for the amount of discs that are being rented. This amount may appear on your account as a "transaction", however, it is a semi-transaction and not yet complete. When the discs are returned, the account is reconciled and the rental amount is then actually charged to your Debit Card account and the remaining "held funds" are released instantly by us to your account. When these released funds are available to you depends on your bank's policies, we have no control over that. When looking at debit card transactions from your bank online capability, it may appear as a transaction initially, but it is really a hold until the rented disc is returned. Q: Can I physically look at the movie box and artwork before renting or buying? A: Yes, you can rent the movie for 10 minutes and return it to the kiosk and there will be no charge to your credit/debit card. This allows you to look it over in more detail if you are undecided. A: For further assistance please call 877-919-9488 Customer Service.